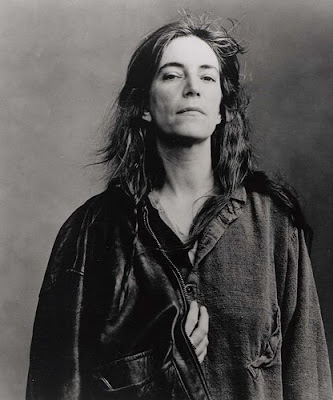 Patty Smith, style insurrectionist--in that she has always resolutely dressed to please herself and no-one else, and insodoing inspired generations of rocker-chic imitators--absolutely loves clothes. "As a young girl growing up in modest circumstances in Camden, New Jersey, [Smith] found copies of Vogue in some rubbish near her home. 'There were Irving Penn pictures of his wife, Lisa Fonssagrives, with her pencil-thin neck, three-cornered hat and gloves. These magazines really attracted me; I began to hoard them and I learnt a lot of things -- what to wear at a fox hunt and so on. But I also learnt about art, because they'd have articles about Dalí or Picasso, and I developed a sense of style.' Camden was also where Philadelphia's wealthy sent their clothes to charity shops. 'So I knew what Dior was, what Balenciaga was, the other great houses. I scouted out the labels. I learned how to put together my look. I was a teenager working in a factory wearing a cashmere Balenciaga jacket, flannel and work boots.'"